From 2012 to 2017, she held the position of Company’s CEO, where she had joined in 2004 as Executive Regulation and Environment Officer. Neoenergia is playing an important role in achieving the SDGs towards a low-carbon economy. She is the Vice-Chairwoman of the Board of Directors of the National System Operator – ONS. She is a member of the Economic and Social Development Council – CDES, and member of the Board of Directors of the Brazilian Association of Base Industry – ABDIB. She is a member of the National Management Committee for Juntos Project. 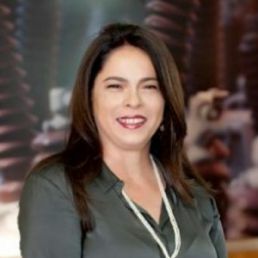 With 34 years’ experience, she built an uprising career in the Brazilian electric sector by serving high leadership offices in major companies, such as Chesf and Eletropaulo. She acted as a consultant in the National Economic Research Associates, in Washington, DC. She holds a Bachelor’s Degree in Electrical Engineering by Universidade Federal de Pernambuco and a Master’s Degree by Pontifícia Universidade Católica do Rio de Janeiro. She was a guest researcher at Imperial College of Science, Technology and Medicine, in London. A successful energy transition towards a cleaner profile, even in countries with a large supply of renewable resources, requires the engagement of all stakeholders and the development of well-built fiscal, financial and regulatory mechanisms, in order to ensure this trajectory. Companies are essential players for the decarbonization of the economy, and the electric power sector is one of the main vectors of this evolution. Long-term investments in technologies, such as the digitalization of the electricity system through smart grids and micro grids, will allow the expansion of distributed generation and will positively impact on the reduction of GHG emissions. In accordance with the UN Sustainable Development Goals 7 and 13, the expansion of renewable energy, in addition to the electrification of the economy, will be the lever of the real change towards this new low-carbon reality.